I promise. 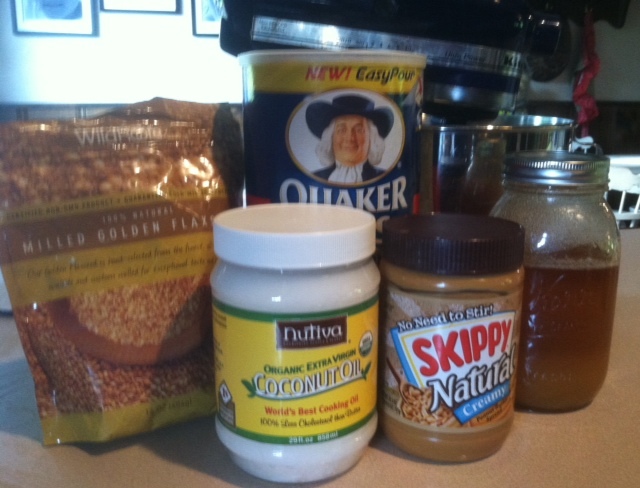 I do make lots of things that do not involve peanut butter, coconut oil, or flaxseed. And I will post some of those recipes eventually. But this morning Chet and I are making our Peanut Butter Power Balls, and I wanted to share the recipe. These little babies are delicious and packed with nutrition and protein. Also, they are super quick and easy. Obviously, the key ingredient is peanut butter. For years, my family has been engaged in what I consider The Great Peanut Butter Battle. I want them to eat natural peanut butter. They act like I’m trying to spread poison on a slice of bread and disguise it with jelly. To be fair, their suspicions are not entirely unfounded- not the poison part but the disguising part. I have, over the years, tried to trick them into eating healthy foods. I’ve baked spinach into brownies, poured healthy cereal into a Frosted Flakes box, and tried to pass off Not Dogs at a cookout. I’ve also saved empty Jiff jars and refilled them with natural PB on numerous occasions. Still, they resist. Finally, I discovered Skippy Natural, and ding ding ding we have a winner. It’s not organic, but Skippy is an Arkansas company, so I’m pretending it’s local produce. It’s a small victory, but I’ll take it. Anyway, this is one of those recipes that is unencumbered by exact measurements. You simply combine the ingredients below until your mixture can be formed into balls. Start with about 2 cups of PB. Add 1-2 cups old fashion oats. Go with 1/3- 1/2 cup ground flaxseed. Add one or two glugs of raw honey. Plop in 2 or so Tbs of coconut oil. And for an added touch of health and deliciousness throw in your desired amount of dark chocolate chips (a.k.a the new broccoli ). Mix it all up adding more of whatever it needs to be the right consistecy. Roll into balls and refridgerate for a couple of hours. On busy mornings, my kids will grab three or four of these power balls on our way out and eat them on the way to school. If the weather is warm, and you want to pack these in a lunch or in your on-the-go snack pack, you might leave out the coconut oil. And if you are watching your weight, don’t make these at all. They are too yummy to eat just one. This is my kind of recipe . . . simple yet tasty! Thanks for sharing and as soon as I gather the ingredients I hope to do a test run with the kiddos. Thanks for the visit as well and abundant blessings to you!